The Holmberg House is steeped in rich history alongside the University of Oklahoma and we are located in Norman, Oklahoma. Professor Fredrik Holmberg and his wife, Signy, built the home in 1914. Holmberg was the first Dean of the University of Oklahoma's College of Fine Arts and was also the first to conduct a symphony orchestra in Oklahoma City. The home was renovated and turned into a Bed & Breakfast in 1993. We are located in the heart of Campus Corner, just across the street from OU and one and a half blocks from University of Oklahoma's Memorial Stadium. The Historic Campus Corner offers restaurants, shopping & entertainment, all within walking distance. Just the right distance from campus, Holmberg House gives parents an exclusive and accessible place to stay for Mom's Day or Dad's Day. Whether you're a proud OU football fan or a visiting parent, here at Holmberg House, we'll have a pillow for your head. At the Holmberg house, we like to offer as many amenities as we can to provide our guests with a memorable stay. From our southern inspired, scratch made breakfasts, to our special occasion packages, our guests will love the experience. 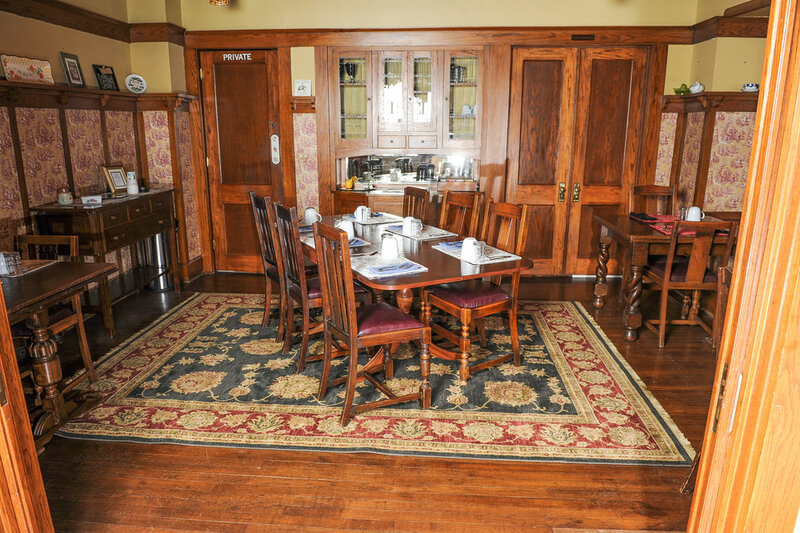 Our breakfast is served every morning in our dining room. The daily set menu is prepared from scratch by your innkeepers from their own recipes. If you wish to have something other than what is offered on the daily menu, please let us know. We are always happy to accommodate, even guest that have dietary restrictions. This package is for the romantic at heart and includes plush bathrobes, bubbles for the bath, fresh flowers*, chocolate covered strawberries, fresh fruit or cheese and a complimentary bottle of champagne. This package is an additional $75.00 and will be in your room upon arrival or delivered at the appropriate time in the evening according to your instructions. *Flowers subject to change based on selection availability. A Bridal Shower, an Outdoor Wedding, an Intimate Wedding Indoors, a Wedding Reception, or an Anniversary Celebration - we have the pace for 50 people or less. Need a spot for your next meeting, try our house. Lunch or breakfast menus available. We will even cater at your place. Mark and Melanie Millsap are high school sweethearts from Muskogee, Oklahoma. They were married in 1995 on the lawn of a bed and breakfast in their hometown. That started the dream of one day owning their own bed and breakfast. Mark's first career was in the newspaper industry which took the family (Mark, Melanie and their two kids, Makenzie and Mason) around the country. With stops in Wisconsin, Alabama and Louisiana, it took the family 10 years to get back to Oklahoma, settling in Norman in 2011. In October 2015, Mark and Melanie were fortunate enough to purchase the Holmberg House Bed and Breakfast and start their new career as innkeepers. Living it up in Norman. City of Festivals” for a reason. Each month there is at least one festival that you will want to see. Stay with us during any OU sporting event, theatre or musical performance, conference or symposium.